One of my favorite not-to-far-away spots for a weekend or overnight getaway is Kenosha, Wisconsin. In a two-day trip, I can tour museums and historic spots (many of them free), take a ride in a streetcar, enjoy the lakefront, shop, visit the Jelly Belly Center and have some good eats. Kenosha has a great mix of spots for foodies of all kinds -- Italian offerings right by Lake Michigan at D'Carlo's, superb German specialties at House of Gerhard, true Chicago-style hot dogs at Trolley Dogs, huge turkey legs at the Bristol Renaissance Faire and candy galore at the Jelly Belly Center. And for breakfast or lunch, I always stop at Frank's Diner when I'm in town. The menu includes all the classic breakfast entrees: pancakes, french toast and egg dishes. A popular one is the garbage plate, a heap of hashbrowns, eggs, meats and veggies - and cheese added if you like. 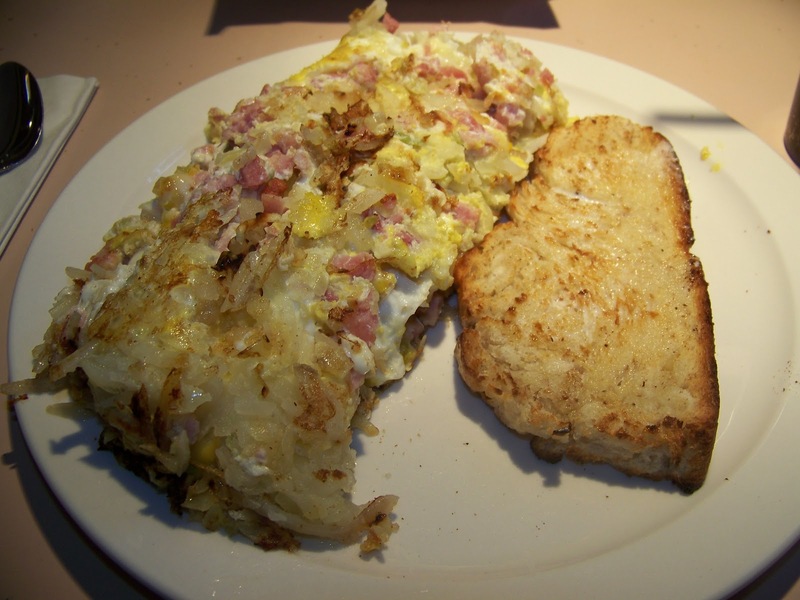 It's classic diner food at its best served with toasted homemade bread. Oh, and you can get a half order of the garbage plate. This is what the half order looks like! Yes, you may need to loosen your belt a notch. The building itself has an interesting history. It dates back to 1926 when, after arriving by rail car from New Jersey, it was pulled by six horses to its current spot. Total cost = less than $8,000, including the shipping fees. A dining room was later added and the kitchen was expanded. It its 85 years meals have been served up to entertainers and musicians, who enjoyed many of the same recipes served today. Should you make your way north of the border, stop in for a hearty meal in a cozy setting. Be prepared for a wait during peak times. They're open for breakfast and lunch and accept cash only. I might have to give this a try. We go to Kenosha quite a bit. My daughter loves Jellybelly! Visiting from the blog hop (and the greated Chicago area! ).